The first Q&A for the year is one of the most fascinating and inspiring stories I have come across in many years. In 2009 Irina Santiago Brown was the special adviser in international relations and foreign investment to the Governor of the Brazilian State of Bahia, a state of over 15 million people. 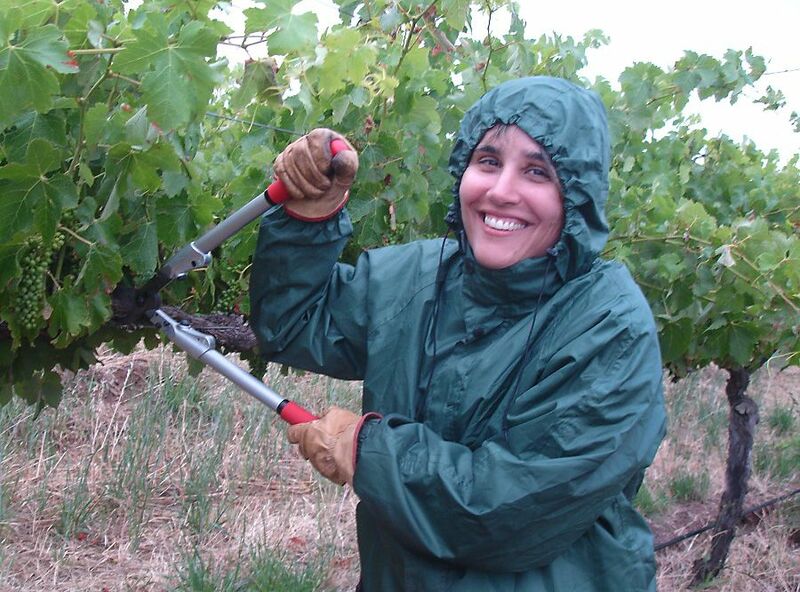 Seven years later in 2015, she was awarded the inaugural Australian Women in Wine ‘Viticulturist of the Year’ award. 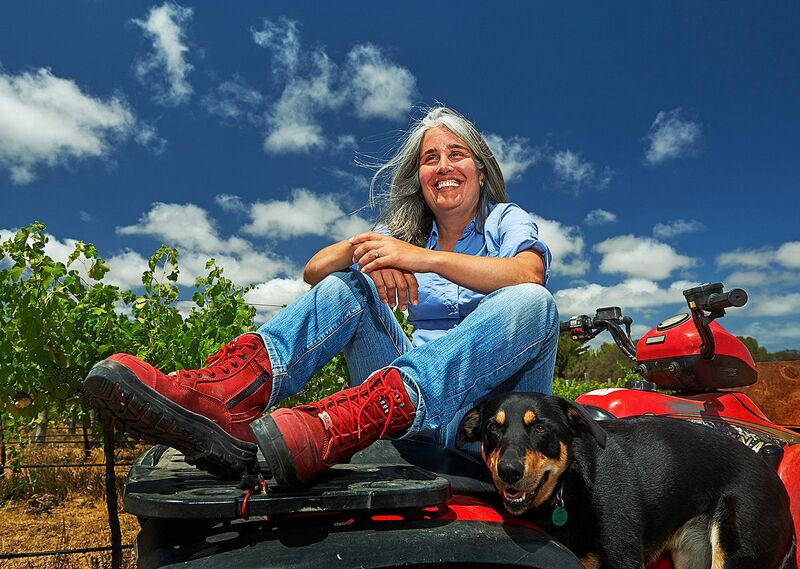 Along the way she moved to Australia, completed her Masters in Viticulture at Adelaide Uni, did a PhD in Sustainability and married Dudley Brown another mid-life convert to the world of wine. 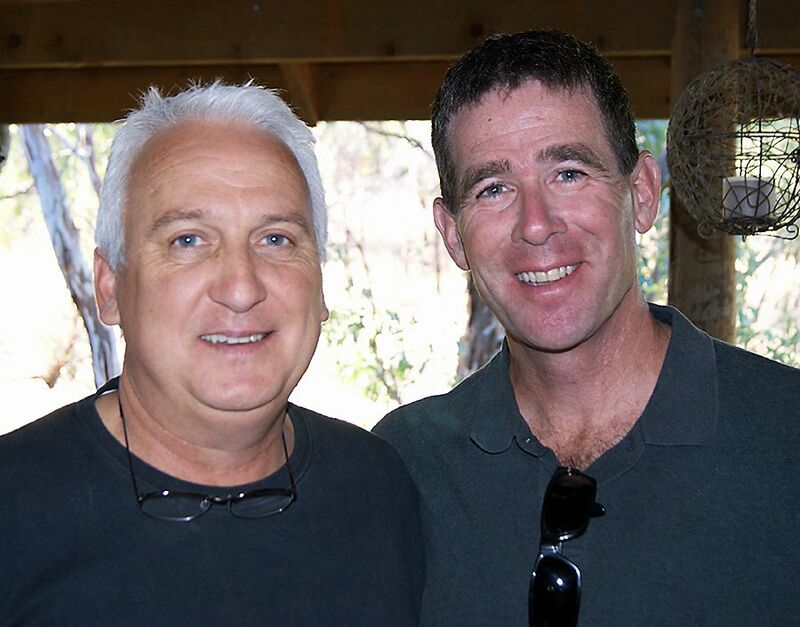 Dudley arrived in Australia in 2003, before that he owned an executive search firm specialising in software and internet start ups in California. 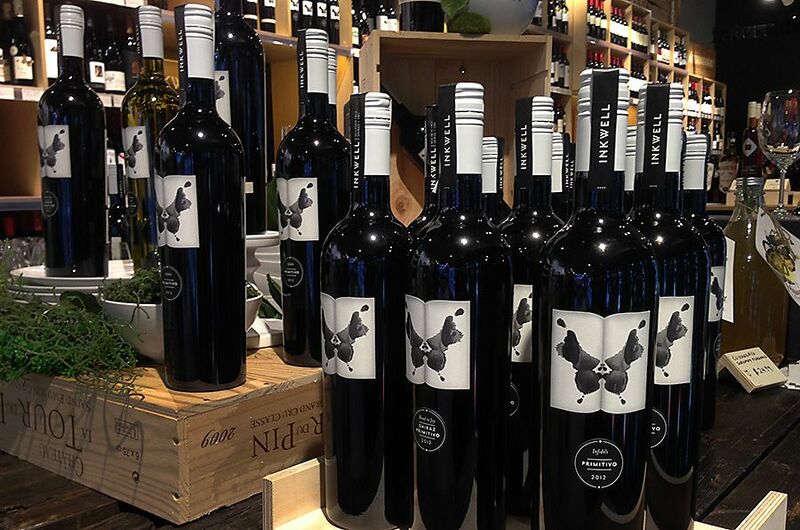 They now live in Mclaren Vale. Together with their dog Daisy they run Inkwell wines. Here’s her story. 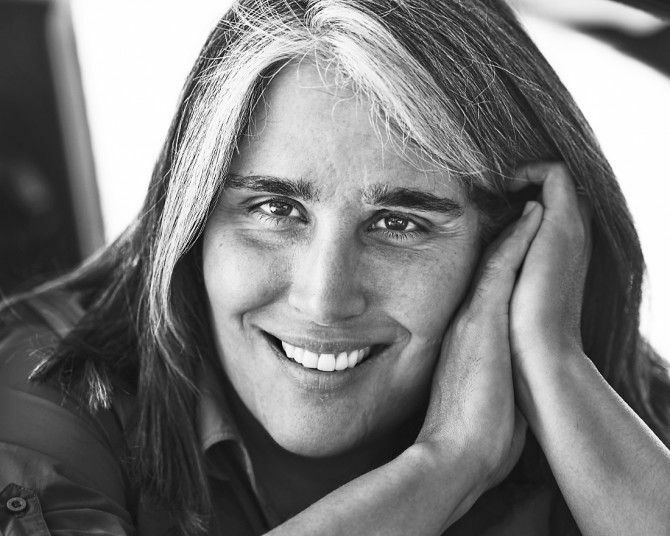 You are the first Women in Wine ‘Viticulturalist of the Year’ winner. How was that ? Irina and her husband Dudley with her award : Photo © Milton Wordley. Life is funny because things don’t happen the way you expect. It was pure happiness to win this award. Much much better than I would ever dream of. The award night had a real grassroots feeling. All the national celebrations were held in the local communities. It was super beautiful, getting the award in my community especially with the other local finalists Rose and Briony. One of the prizes was a pair of red boots, I can’t wait to get them. I wore boots on the presentation night with yellow socks, the same ones as when we got married. Boots are a symbol of my change, because I never wore boots in my life before in Brazil, I was always formally dressed. Irina in her winning Red Boots with Daisy : Photo © Milton Wordley. I just thought it was such a special night, irrespective of the result, I was celebrating in my community and just being a finalist was enough for me. I was a winner anyway and put my special boots and yellow socks on for this occasion. 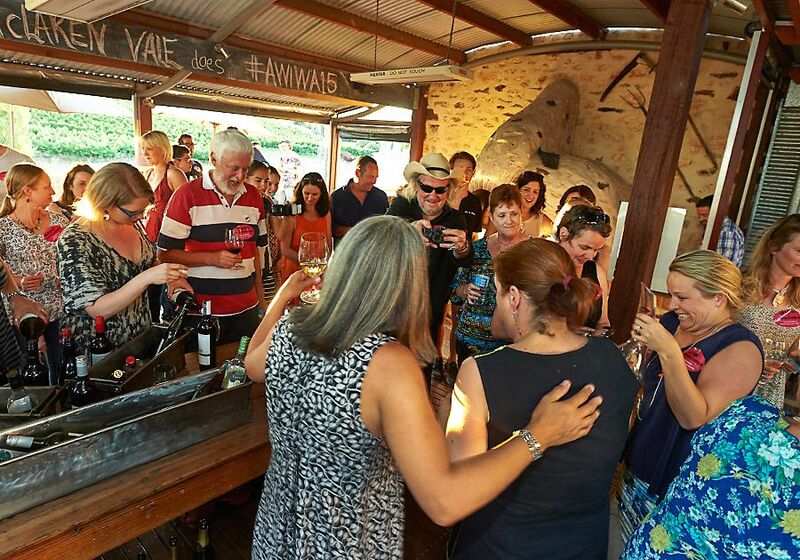 The crowd at McLaren Vale for the Women of Wine Awards presentation : Photo © Milton Wordley. What’s your opinion on these new awards for Women in Wine ? 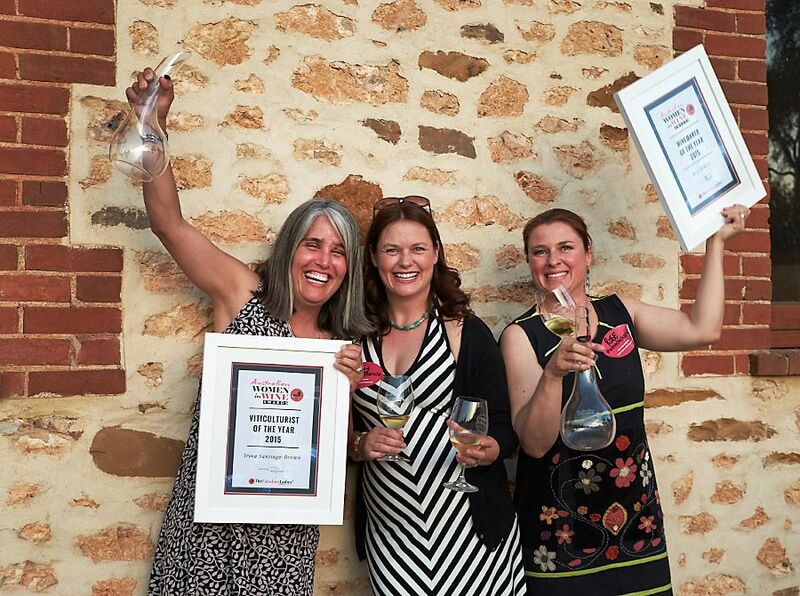 Irina with Briony Hoare, and Rose Kentish at the Women of Wine awards presentation : Photo © Milton Wordley. To start off with I wasn’t very keen to enter, I didn’t know anything about the statistics about women employed in wine. 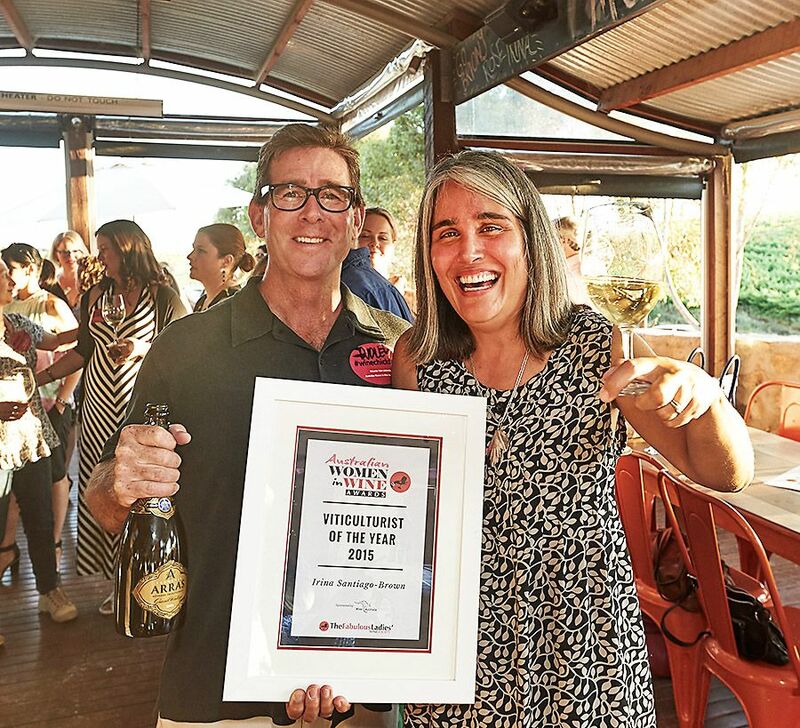 I think this award is absolutely great because it brings some sort of thought to the percentage of women in the wine business. People make jokes about it, but prejudices are real. Clearly there is something in the work place that needs to be discussed and resolved. It’s a challenge but it’s also an opportunity to bring it to the fore. Dudley and I run Inkwell Wines. 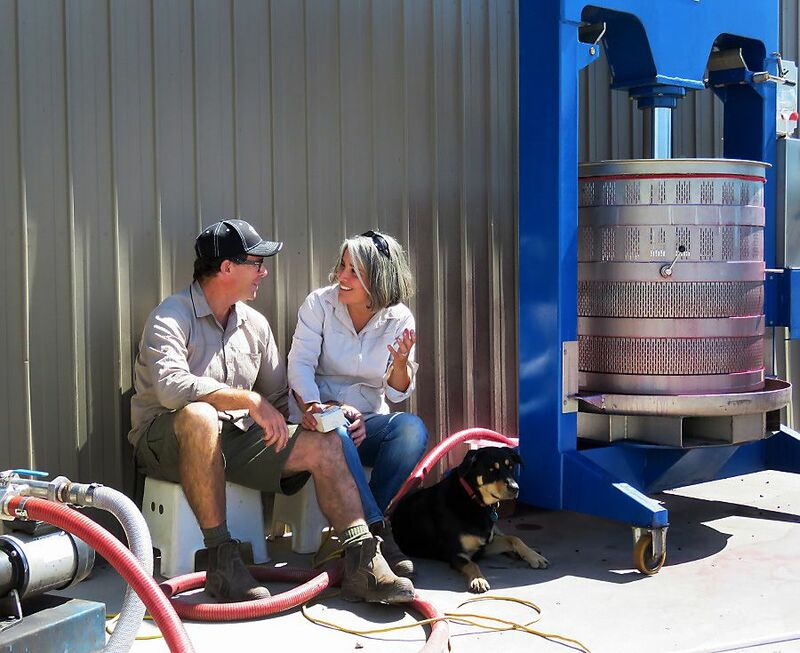 We are mid-life converts to wine growing and winemaking, and both left overseas careers in high tech and government to move to Australia. We are fanatical about our vines and wines. Irina Santiago-Brown and Dudley. Photo © Milton Wordley. I’m a why, why, why person. I drive Dudley crazy, and a he’s a why, why guy, but I ask whys on the top of his whys. I have a thing for processes, I want to know how to make things quicker and better. The management experience I had helps, and now everything makes a lot of sense. Inkwell’s going well. 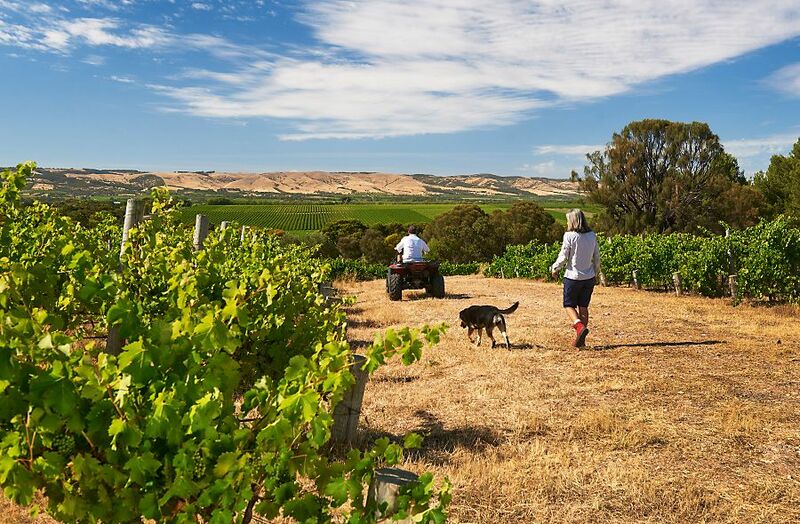 Our vineyards are thirty acres of low yielding Shiraz, Grenache, Mouvedre, Primitivo, Cabernet Sauvignon and Viognier in the South West corner of the McLaren Vale district. We are very close to the sea on a really special site. The Inkwell Viognier vineyard. Photo © Milton Wordley. Because half of a grape vine is below ground, we spend as much of our attention on soil, roots, nutrition and soil moisture management as we do with the visible portion of the vine. 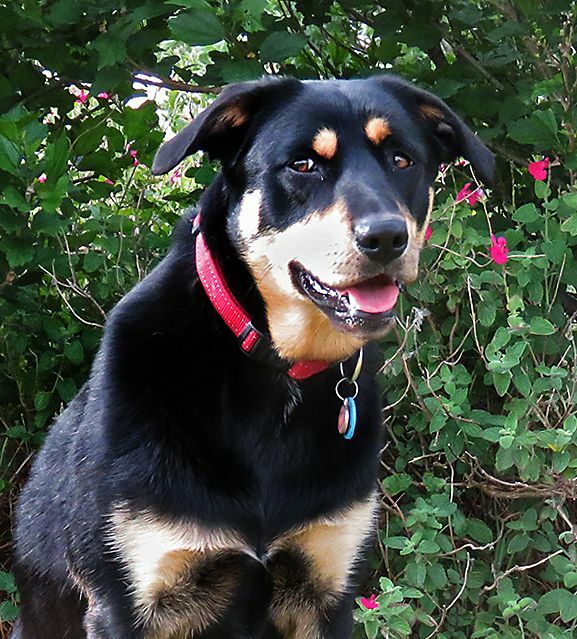 Daisy the dog : Photo supplied. The geology is very interesting. 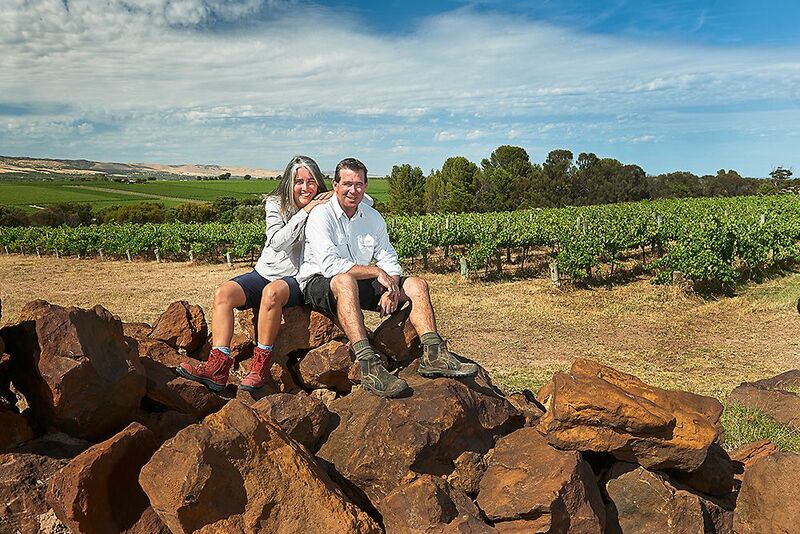 The vineyards straddle distinct one to two million year old exposed geological formations: Pirramimma Sandstone and Ngaltinga. 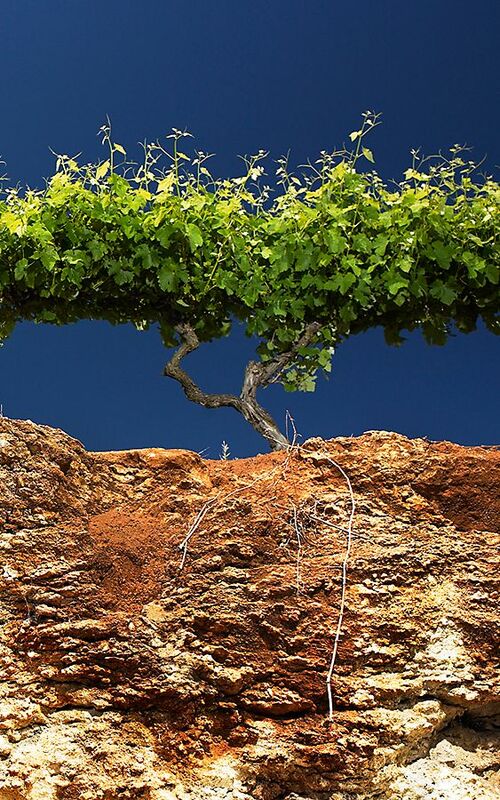 These formations create ideally difficult growing conditions for growing wine grapes with intense flavours. And somehow combined they characterize Inkwell wines. We keep things simple: one tractor, one forklift, one de- stemmer, one press, lots of small fermenters and just twenty amps of electricity. What did you do before starting your career in Wine ? I was the special adviser in international relations and foreign investment to the Governor who is the head of the Government in the Brazilian state of Bahia. 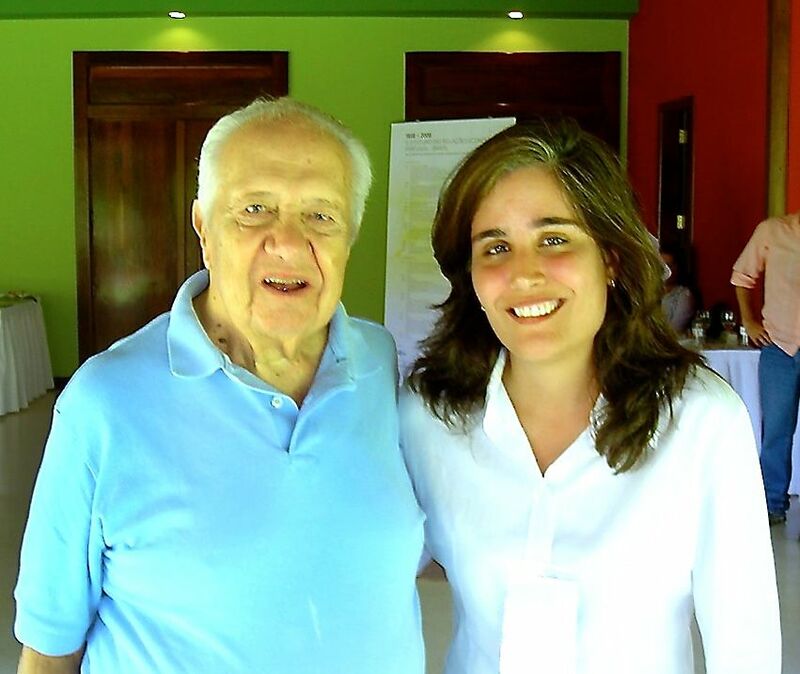 Irina with Mario Soares, the former Portuguese Prime Minister and President : Photo supplied. A state of over 15 million people. Why did you leave Brazil, and why a career in wine and viticulture ? I was about 36 or 37, had a great job. In a few years time I would be 40 but I wasn’t involved in politics, which is extremely unusual for a position like mine. Forty is a very iconic age for women. It’s an age where if you want to do something to change your professional life you need to make some big decisions. I decided I needed a change. I knew I had no way to go forward in my career without becoming a politician. I was at the top. I thought if I’m making a radical change in my life and leaving a job that everybody thinks is the best job in the world, I better get it right and for the right reasons. When I told my mother she thought I was totally insane. I have a Masters in International Relations. The research was on international regimes for agriculture. That was my first bridge towards wanting to do something in Agriculture. I wanted to complete things, be part of the whole cycle of something and agriculture was the way to go. At same time I couldn’t think I would be happy just growing anything. Grape growing is so closely related to wine that it is irresistibly interesting to me. At official functions we often had some wine, but I did not know much about it or have time to learn. When you are having fun with your friends in a hot and humid place, you drink what most people drink: fruit based drinks and beer. I always thought about wine as a product that has all these nuances I like. It’s an alcoholic drink but it’s not associated with trouble, it’s all about celebration and eating well. It’s about growing, making, and celebrating, often with a meal. It was really a perception I had. I thought wine is an industry that was related to agriculture. It seemed to have all the “ticks” that I wanted. So I did my research and put in my application for my masters in viticulture at the Adelaide University, Waite Campus. I got accepted. I had some funny moments at the start, I remember coming out of a month before the classes started. My English was okay, but Australian English is totally different. The coordinator of the post-graduation at the time was Dr. Brent Kaiser a Canadian Professor. He was busy, but always available and he seemed always very happy with his family and with his work, always smiling. He helped me through the first few months. To be honest, back then a plant was something that had roots, a trunk, leaves and then, sometimes, fruit. I really didn’t know much more when I started. During my first year, I was just studying all the time trying to catch up. I wasn’t even sure in which country I was living in. The library was my country ! Later my PhD supervisor, Dr. Cassandra Collins amazing attitude reminded me of Brent . I thought, wow this is interesting, these people are happy, they seemed to be doing what they wanted to be doing. It was not easy at first but that observation really helped me to get through the hard parts. They were busy like I was in my previous career but unlike my previous career; their personal life seemed balanced as well. You earned a Masters and then did a PhD in Sustainability in Viticulture How did that change you view of things ? My first sustainability ‘in love’ moment was when I thought I had fallen in love with Biodynamics. As I got more into it, I realised we have wet years and dry years, lots of people had to make hard decisions on what to do. Uni of Adelaide. 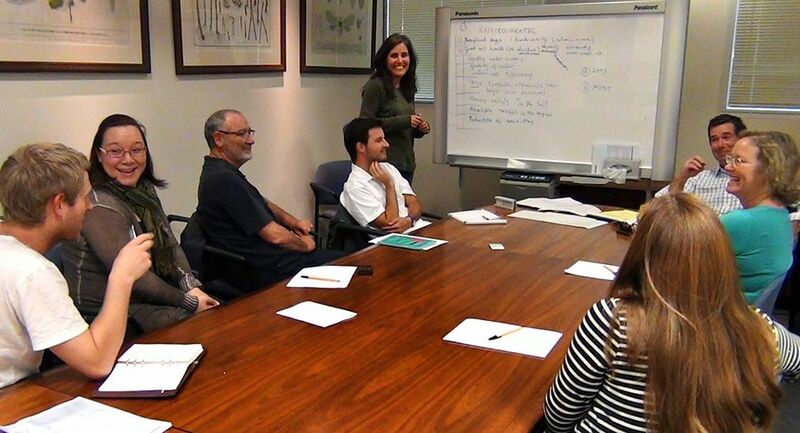 Focus group for Irina’s PhD research : Photo supplied. If you’re certified, and you have to spray inorganics to save a crop you may lose your certification. That made me start thinking about sustainability in a more practical sense. I was thinking, is it possible to stay biodynamic and sustainable? If I can avoid synthetic chemicals, I do. But if I need to use chemicals, I use them wisely. Discovering better ways to manage a vineyard: cause and consequences, intervention where necessary, but responsible intervention. We have some birds here, they don’t bother me if they eat 5% of the grapes. Should I be shooting birds and spraying crazy things around just because I saw a little bug? I try to understand things in a deeper way and then make better decisions based on what we believe and the long-term economics. That’s what the university gave me, knowledge to understand balance in an objective way. 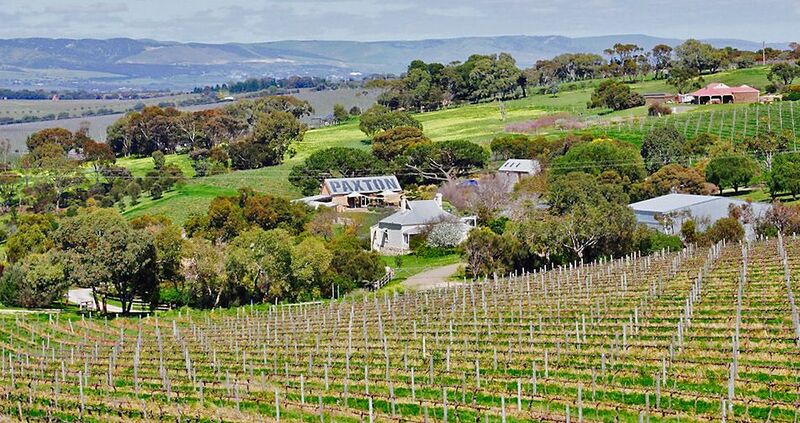 How did you find yourself settling in McLaren Vale ? I didn’t really choose McLaren Vale. It just happened. When at university we did many day trips. 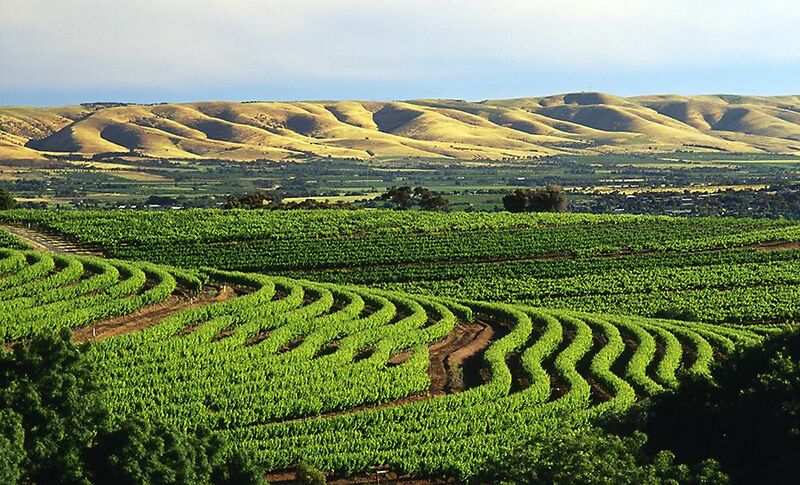 One of them was to McLaren Vale and I just loved the place. One of the first places we went to was Paxton’s. And I really liked what they were doing with Biodynamics. Paxton Wines. : Photo © Paxtons Wines. I thought “this is fantastic I need to learn more about this”. So I applied to work there. Irina at Paxtons, cutting off too long cordons : Photo supplied. I sent emails to apply for a job, they ignored me. I then send a two page email telling them I was not applying to anyone else and explaining why I wanted to work with them. So they couldn’t ignore me any more. That was my first McLaren Vale connection. This was before I had been accepted into the PhD, when I was concluding my Masters. I had met Rae and Drew Noon while I was doing my Masters. They invited me for dinner one night. It was a beautiful dinner and one day Rae sent me an email telling me about a job. Rae said, “this job is for you”. She knew I was going to do research on sustainability. It was a job at the McLaren Vale Grape, Wine and Tourism Association. They were looking for someone to help develop and implement their sustainability program. I thought, wow this really is for me. I needed this job. In spite of having a full scholarship, I needed the money and it would connect me with the community. 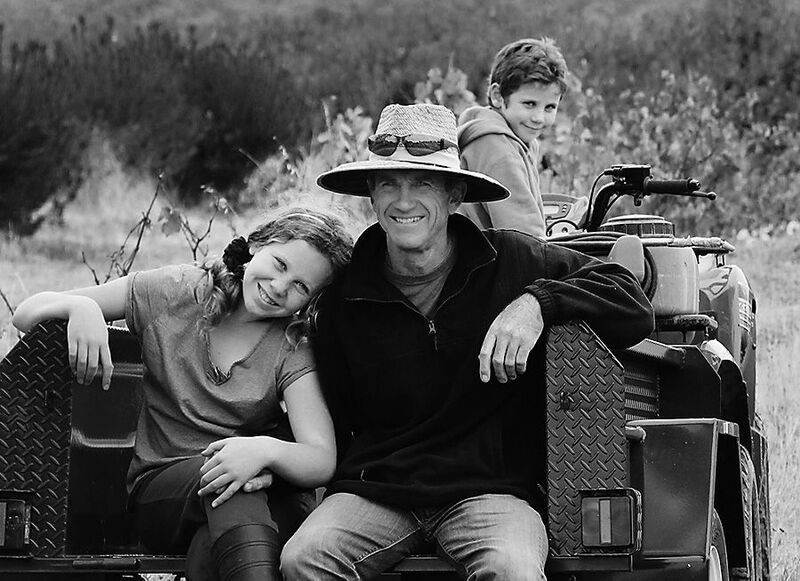 Drew Noon and his children Indi and Harper : Photo © Noon Wines. I would also get some practical experience with great growers that I simply wouldn’t get just doing the PhD and being behind a desk at Waite. So then I had this problem, how can I be a full-time student and work two days a week ? So I talked to my supervisor, she talked to the coordinator and they also thought it would be good for me to have this experience. We then had to talk to the Dean and explain my whole situation. After a long conversation, he agreed for me to be at university three days a week, and to work two days. We also agreed that I would have the same deadlines as a regular full time student. That I could not use that as an excuse not to finish on time. And so, I did. I finished exactly one day before the 3 years deadline. I had my interview in December 2010, that’s when I met Dudley, he was the Chair of the association at that stage, Sami Gilligan and and Elizabeth Tasker. I started my new role in January 2011, after also being interviewed by Pip Forester who became the Chair after Dudley ended his term. 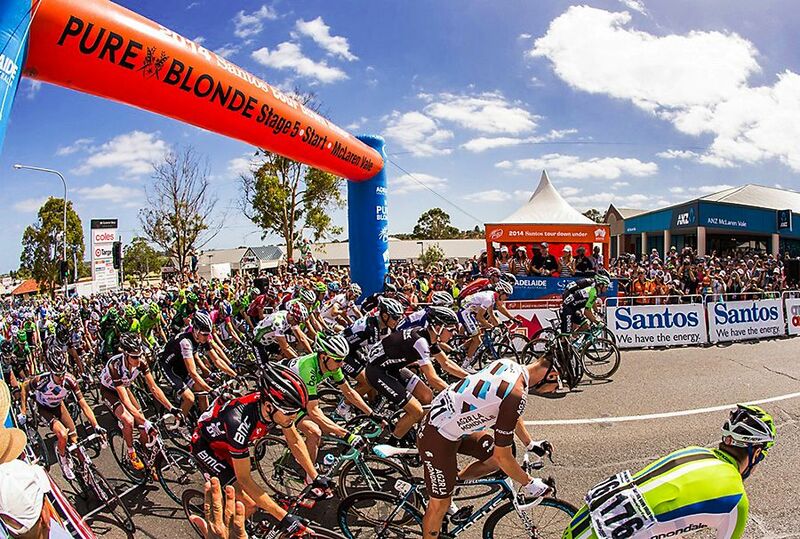 What is it you liked about this McLaren Vale community? It’s amazing here, I have this feeling that whenever I have any problem, from a brown snake bite (Daisy Brown likes brown snakes!) to a flat tyre, I have no shame to call someone. Vintage with Jock Harvey : Photo supplied. For me, one of the most iconic people is Jock Harvey. I think 90% of the local community feels the same way. We joke that there are clones of him because he is everywhere. If you ask for help, and people are available, they help. For instance, if I’m doing something I don’t know how to do, all I have to do is shout out for help. Everyone might be busy but they are still somehow available. There is this sense of, I will help you if I can. Like Phil Christiansen and the way he operates his winery. He is so organised and efficient. Phil Christiansen with Dudley at Dudley’s 50th birthday : Photo supplied. So I asked him, can I come and work with you for a couple days to spy on you ? Like the Noons, Phil changed the way we thought about a number of things we do at Inkwell. He’s amazing! Only later I found they grew up and went to school together. He also organises a local growers lunch. People bring along their wines. It’s a very funny lunch, we taste the wines blind and score the three favorite ones. We have this open voting system, it’s super fun. McLaren Vale just felt welcome. People here are generous, they open their doors. When we were planting the zinfandel bush vine block at Inkwell on a Sunday morning, Jock just showed up. “Do it this way, it’s more efficient” he says. So we say okay, and it’s really helpful. We’ve learned from so many great people. McLaren Vale, sweeping vines. Photo © Milton Wordley. Why does Sustainability matter ? It matters because if you’re a farmer you need to continue producing. I don’t like this speech of sustainability just because you want to save the world. Of course everybody wants to save the world, it’s just common sense, but it’s too subjective and does not help much in finding practical solutions. If you’re a business, especially if you are an agriculture business, and you’re depleting everything on the land you actually earn a living from : you’re in trouble. I think sustainability is holistic. It’s about everything, from the consumer, who wants to drink high quality wine at a reasonable price. It’s about the farmer who needs to continue producing. It’s about the little shop that’s selling the wine. I’m talking about people in this community who grow grapes and make wine. Put it very simply if they don’t support the community they live in, and protect the land that produce from, and of course if they don’t make any money, it’s over. 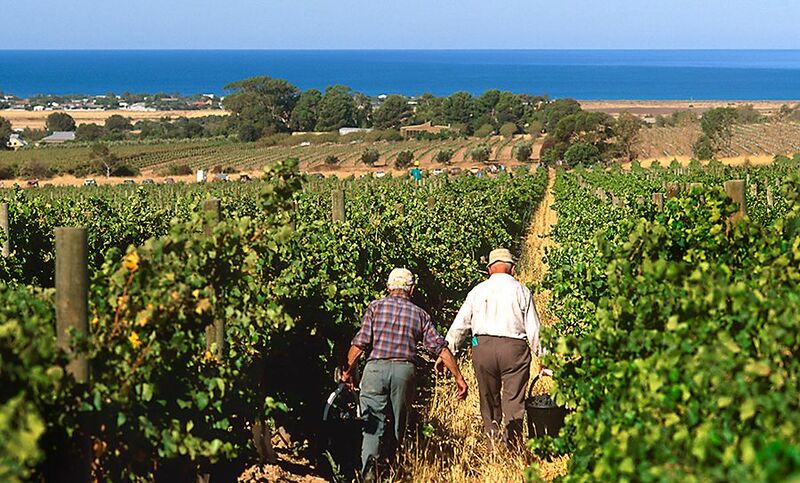 My research is about farmers, grape growing and having a sustainable community. How did you apply that to McLaren Vale ? 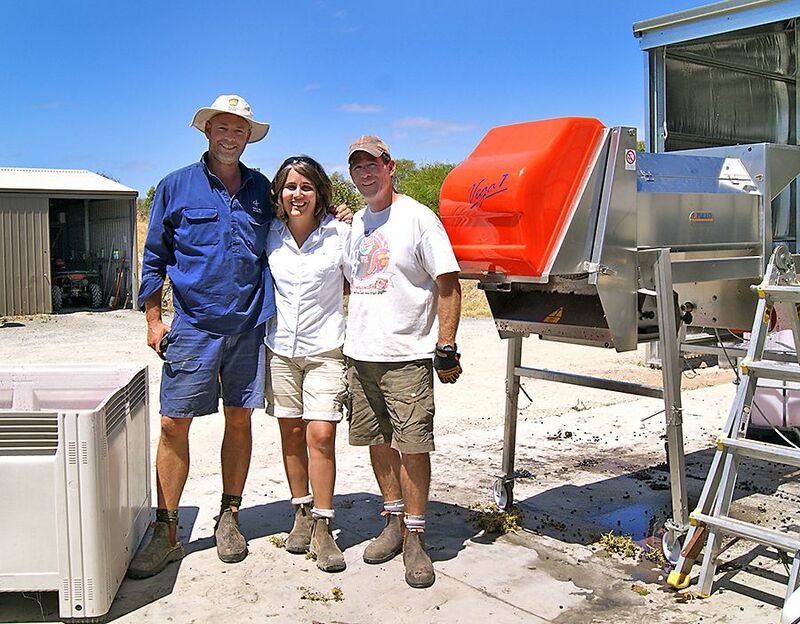 When I started my new job, McLaren Vale already had an initiative called Generational Farming. I was hired to manage that and make it happen. When I started it was clear to me, they just didn’t have the resources to do it properly. Perhaps due to my limited knowledge of viticulture at the time, I could not accept the general outline. I kept asking why why why. I felt it needed to come to conclusion, but this was not possible in its current form. To continue I had to change the criteria completely. The program was good but the results were inconclusive. The research side of me could not accept the way the assessment was done. I learned one thing very quickly, when you’re talking to a farmer, they don’t like when you tell them how to do things; especially if you are a 38-year-old Brazilian woman with no experience ! There’s no formula, you can grow grapes differently and efficiently, but you really need to be aware of the consequences and understand your decisions. The program was developed to promote this. I thought the report I put together was the biggest accomplishment of the program. We had 100 or so questions in a spreadsheet. They were divided into six chapters, soil, pest and disease, biodiversity, water, waste, and social at the time. A lot of numbers and results but it was extremely hard to see the big picture, to find out what to do with that, beyond the learning from the assessment itself. As each topic, section and chapter has a weight attributed to them, it was possible to present and completely compare different results among each other. To understand if someone’s water management was more or less sustainable than their biodiversity management, for instance. It compared practices to what are considered best possible practices and the results were presented in comparison to their peers. Growers could then see how they were doing compared with the rest of the community. 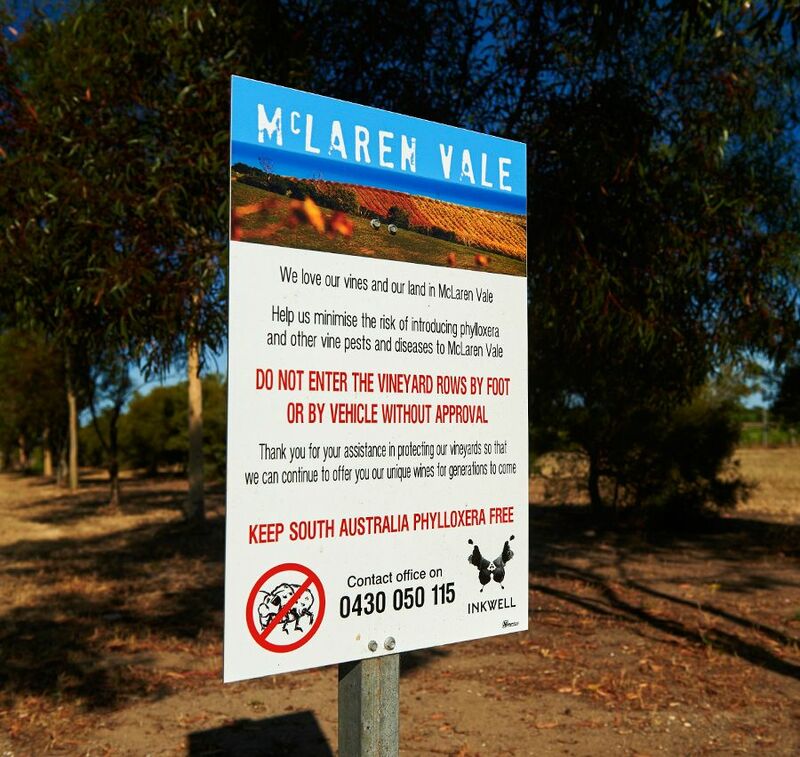 One of the new McLaren Vale Phylloxera signs. Photo © Milton Wordley. At one stage McLaren Vale scored very poorly in biosecurity. This report helped us develop a regional biosecurity code for example. While we don’t have phylloxera, that doesn’t mean people should not be aware of it and shouldn’t have it on their list. The community needed signs to say “please don’t step in the vineyard if you have been in another vineyard.” Simple things like that are essential for our long-term sustainability. I think people received it well, I often felt like I was repeating myself all the time. I kept saying scoring is not important, because nobody is going to know about your individual score. If you’re lying about your business to score high you’re not fooling anyone or learning anything, you’re just wasting your time. The last chapter added was economic sustainability which talks about things like planning, involving growers’ families in everything. Simple things like, “do you know the password of your accounting system, or your bank, where is the key for whatever, how to call your pruner ?” because if you don’t know these things it will cause your business a lot of problems if something happens to you. How did you launch the report to the Community ? I thought it’s very important to keep the community together when we first launched the program and explain what we’re doing. We made it after work hours and invited the whole family. At the time, I had this feeling that the women were much more involved then anybody thought and I didn’t want it to be a men only event. I was right, the women were very involved and an important part of decision making. 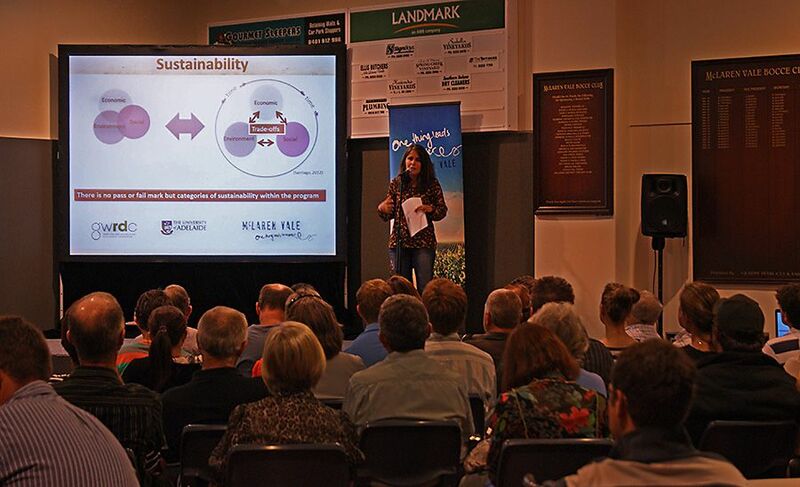 The first Sustainability presenation at the Bocce Club : Photo supplied. I’m not involved any more but I think it’s been successful. I stepped down, because I always thought that if the program would not work without me it was not sustainable. It was very hard for me to walk away. It was my baby, it was three years of my life, my research. I changed everything even convinced everybody we needed to develop the online system. It was partially funded by PIRSA. PIRSA do a very good job. I believe you make some Orange wine , tell me about it. I just did this crazy little tiny project. It was originally 130 litres but Dudley stole most of it to be blended with our Blonde on Blonde Viognier. He made the right decision as the orange Viognier added this amazing nose and focus to the wine. Dudley, Irina and Daisy during vintage. Photo supplied. So, I was left with 20 litres of orange wine that I decided to bottle. I thought why not, right ? Orange wine, for me, is white wine made like red wine. In our case, we don’t have enough electricity here, so we can never make white wine in our shed. I was interested to see how our Viognier ,which has high acidity, would look. I thought – for some fun – I would show it to Philip White. Whitey is not a great fan of Orange wine. So I thought he was the right person to ask. When I came with a hand written bottle of orange wine to see him, he laughed right away. I said I wanted to make something we would enjoy drinking, but I don’t know much about orange wine and I really need an honest opinion, so what do you think? Dudley was watching the scene with amusement. Part of the Inkwell Range : Photo supplied. He tried it at room temperature. I’m not sure if he really liked it, but we stayed for an hour drinking it and talking about it. So, I think he did. We will make orange Viognier in 2016. Dudley has this saying, if we don’t like the wines we produce at Inkwell, we don’t bottle them..
You married Dudley Brown two years ago during vintage. A memorable night ? We got married in the middle of vintage on 23rd of February 2014. It was an amazing night, we announced our marriage on social media 48 hours before the wedding. I didn’t want anyone stressed during vintage. The WBM ‘Selfie’ competition winner. 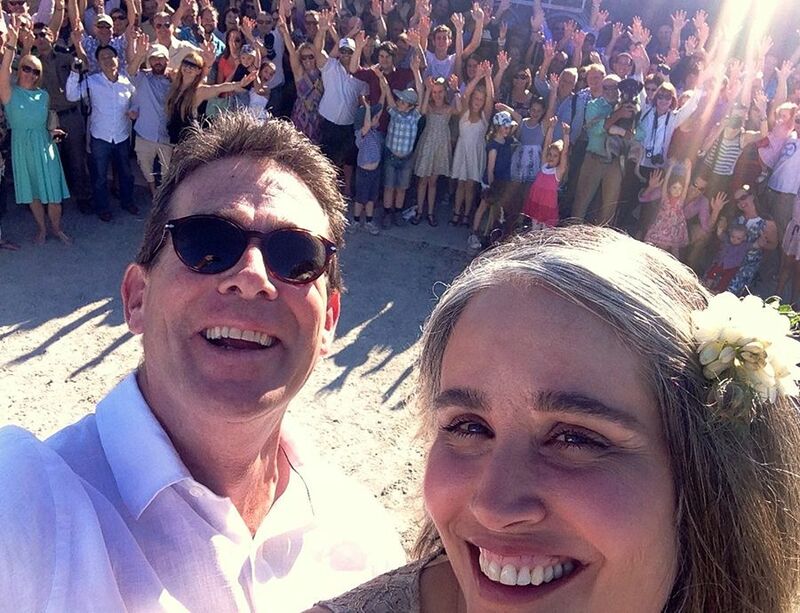 The Wedding Portrait : Photo supplied. I obviously told my family before, they were happy for me. Dudley has his family in the United States; we told them as well. But the short notice made everybody’s life easier. Australia is far away from Americas. A lot of people came covered in grapes, in their work-clothes. Others came casual. Some, like Leon Bignell, came in leisure suits!. Great mix, very relaxed. We told people not to bring any presents just bring some bubbles and celebrate with us. 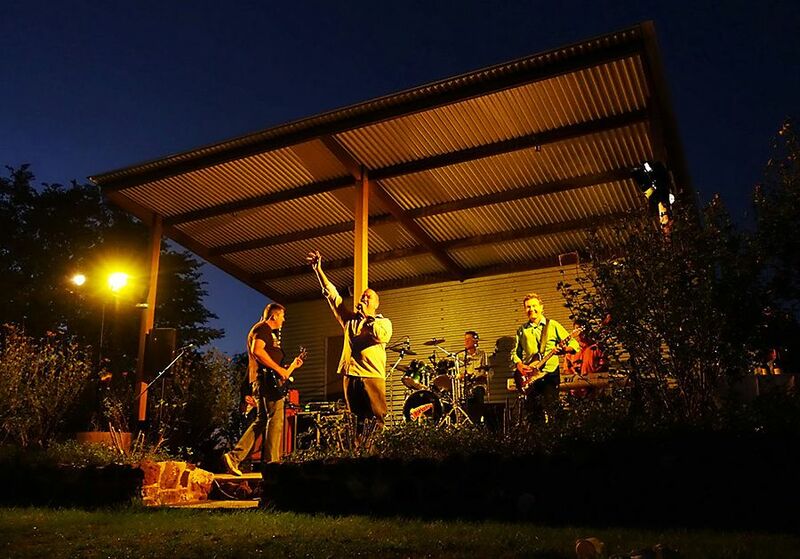 I wore my boots, the symbol of my life change and local band Silverhair played for hours. The Wedding Dance. Photo © Philip White. Luckily they were happy to swap part of the payment for some wine. People brought their kids, even their dogs. It was a bit different from most weddings. 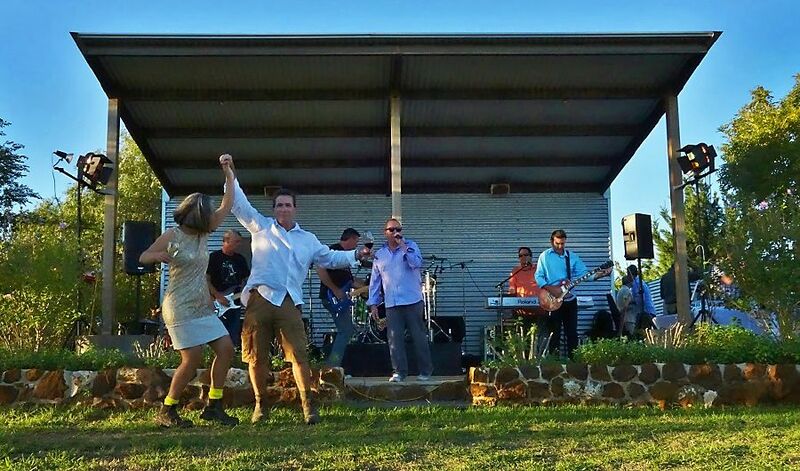 Local band ‘Silverhair’ played for hours at the Wedding. Photo © Philip White. I’m told Dudley tries very hard to surprise you each year on your birthday. What was the most memorable surprise present ? Bintang in the Rose Petal bath : Photo supplied. This year we went to our first holiday in Bali. I needed just to relax, and do nothing. I said, “I don’t want to meet with anybody, I don’t commit to anything, I don’t want a single appointment related to work.” Travel was always related to work, my research or Inkwell. So we were in Bali. He gave me a very girly gift, a Rose Petal bath, it was beautiful, a bit like that scene in the film ‘American Beauty’. To complete the surprise and the uniqueness of the moment, he served me cold Bintang , the Indonesian beer instead of the expected champagne. I don’t normally drink beer, unless during vintage, but it was just perfect. A combination for me nobody we know would believe. Life has to be fun. 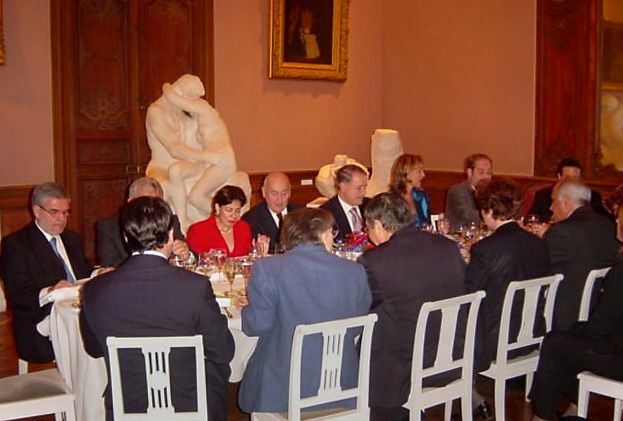 Last Supper : Food and wine ? Funny story, first time I met Dudley I thought he’s interesting, cute, but I didn’t know anything about him. He seemed smart. Someone told me he was single. 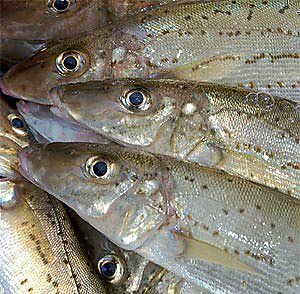 South Australian ‘King George Whiting : Photo supplied. I said good, but something was missing. My last question before I kissed him, was “do you know how to cook?” He kind of looked at me and said “yeh!” not really understanding where I was going. Then I said, “do you enjoy cooking?” he said “yeh I enjoy cooking.” I thought great, he’s perfect.” So I kissed him. He’s does all the cooking now. He really is perfect ! My last supper would be Dudley cooking for me, what ever it is and drinking whatever Inkwell matches the food. Inkwell is the symbol of our dream, our life change. It is the cement in our lives together. We live in such a special place. The food is amazing. The seafood from South Australia is so fresh, so, on hotter days, a local fresh fish with chips and Blonde on Blonde Viognier. In cooler days, one of the Inkwell reds, Shiraz, Primitivo or Cabernet Sauvignon with a Black Angus fillet or barbecued Santa Maria Tri-tip served alfresco.